Swatkins Group were once again proud to be a part of the Trophex live show at the NEC in Birmingham earlier in January. It was the launching date of our brand new, Leatherette Awards and Gifts catalogue. 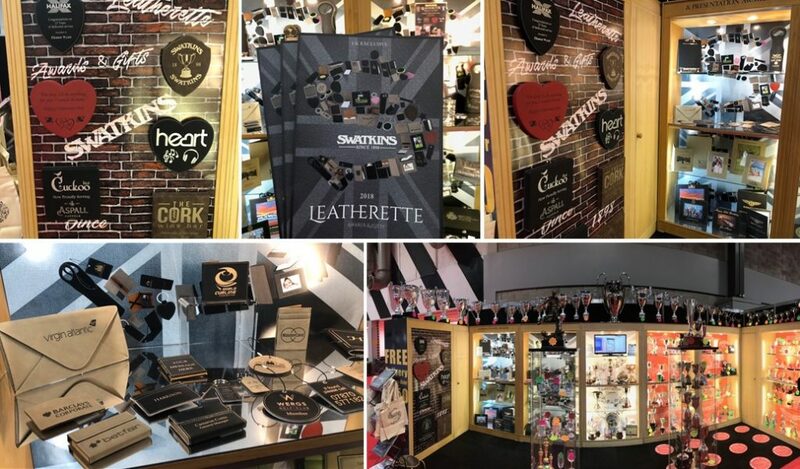 After introducing the Leatherette range in our 2017-2018 Main Swatkins catalogue, and after tremendous success – we are extremely happy to launch a brand new, exclusive catalogue – dedicated to Leatherette Awards and Giftware. We had tremendous feedback from the show – and are happy to announce all new products are now in stock. We also proudly had on display a manufacturing process cabinet, showing our clients some of the tools and processes that have remained unchanged over centuries. We also had our corporate video playing that we had produced at the end of last year. If you have not watched our video please take a look here. Not only this, we had an additional stand packed full with the best offers and clearance deals – if you did not get a chance to visit, please just get in touch and we can send the clearance spreadsheet over. For more information on the Trophex show, please follow a link to their website, here. If you require any more catalogues, picture discs, a catalogue link or any further information on our new products, please get in touch with one of our friendly sales representatives. We thank everyone for visiting our stand at Trophex on both days, and we hope you all got home safely and we look forward to another successful year in 2018 with you all.